Takes 2 hours Minutes , serves 12. 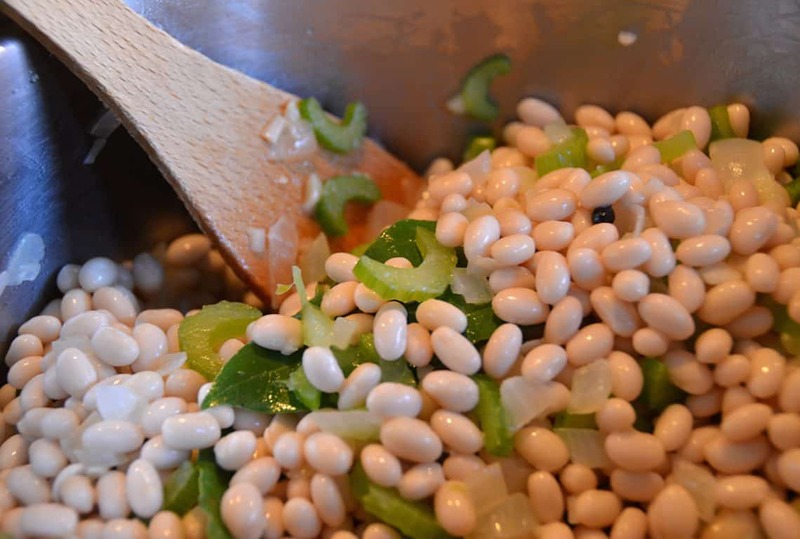 Place navy beans into a medium-sized bowl. Add 8 cups of cold water. Soak for at least 8 hours, rinsing the beans and changing the water twice. Melt butter in a large soup pot on medium heat. Add chopped onion, garlic and celery, sautéing until soft and translucent. Add peppercorns and bay leaves and cook stirring for 2 minutes. Stir in drained beans, cover and cook for an additional 2 minutes. Add boiling water, carrots, parsnips and smoked ham hock or smoked turkey thigh. Turn heat up to medium-high and cook until soup comes to a boil. Reduce to simmer and cook for 1½ hours total. At the 30-minute mark, remove the carrots and parsnips allowing them to cool. At the end of the full cooking time, remove ham hock or turkey thigh from the pot and set aside to cool. 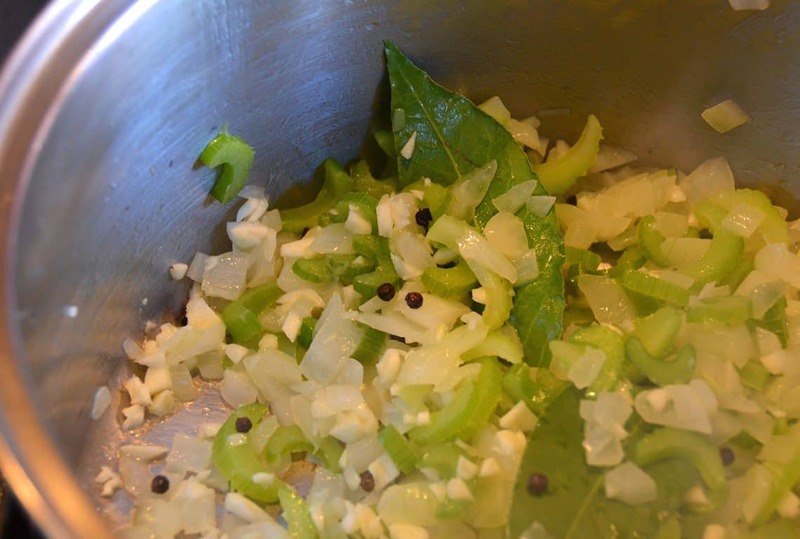 Remove bay leaves and discard. Transfer hock or thigh to a cutting board and carefully pull the meat away from the bone. 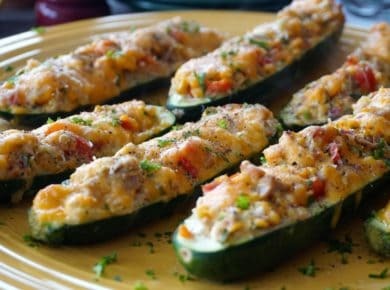 Trim and discard fat from the meat throughout. 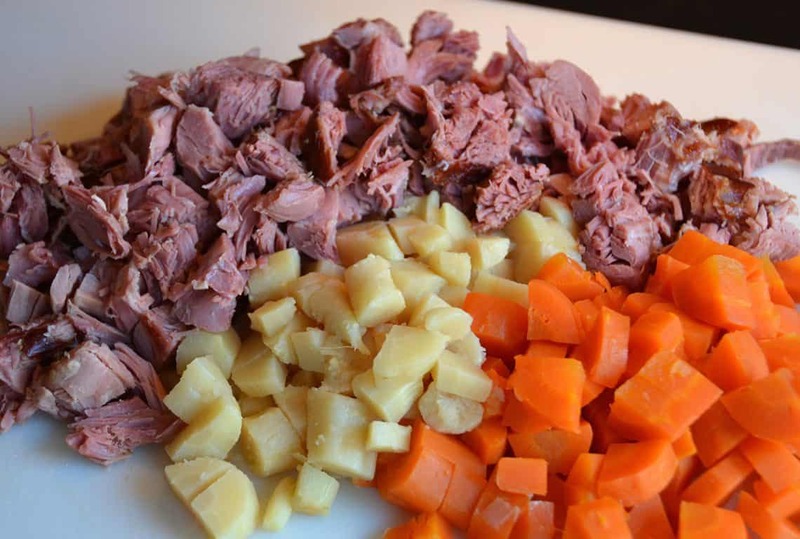 Chop the trimmed meat, carrots and parsnips into bite-sized pieces and return to pot. Stir. Add salt to taste. Stir in chopped flat leaf parsley. 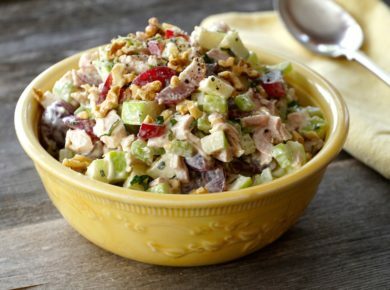 Serve immediately in bowls or soup plates. Note: I don't remove the whole peppercorns from the soup before I serve, but I do let everyone know that they're there! 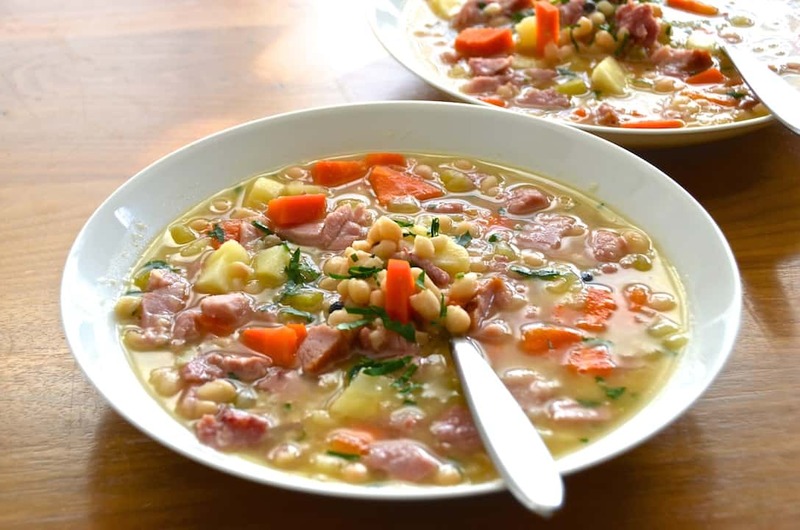 This Navy Bean Soup with Ham always delivers! 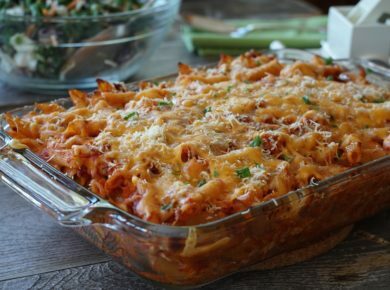 It’s hearty, wholesome, fantastically flavourful and easy to prepare too! 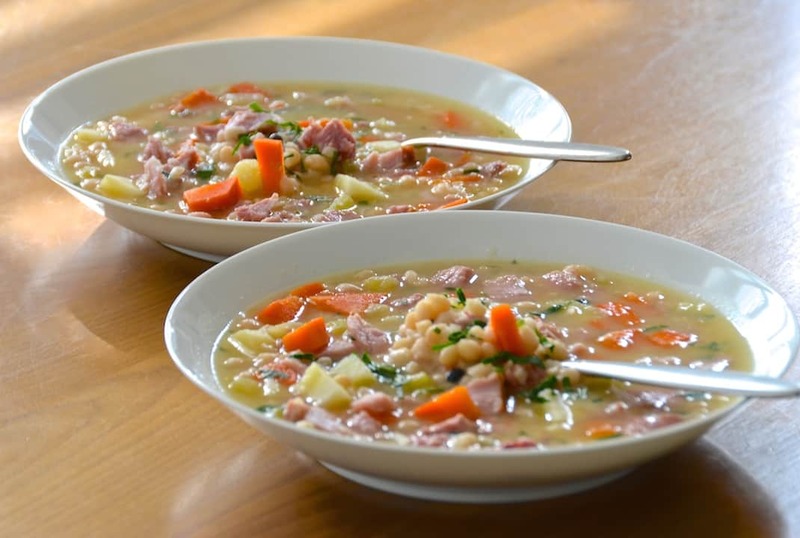 We first posted this old-fashioned navy bean soup recipe almost three years ago when Weekend at the Cottage was just getting started. 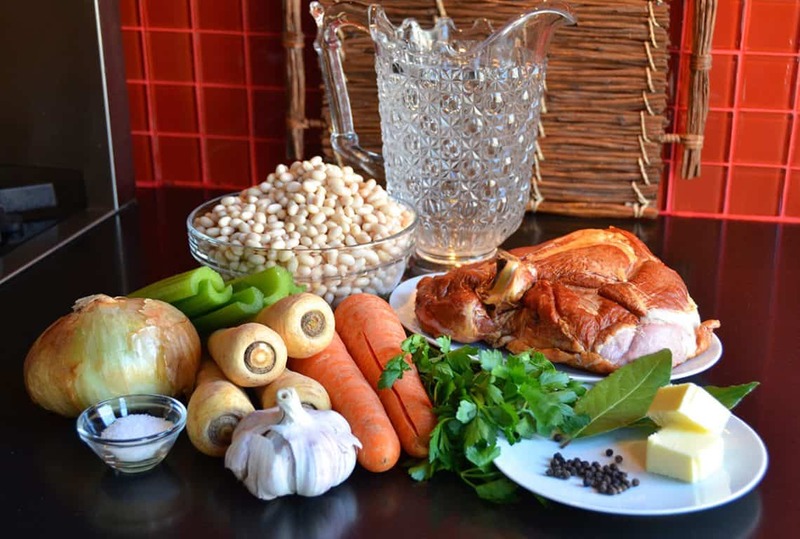 Back then, we made the recipe using a SMOKED TURKEY THIGH to give the soup it’s distinctive, smoky flavour. 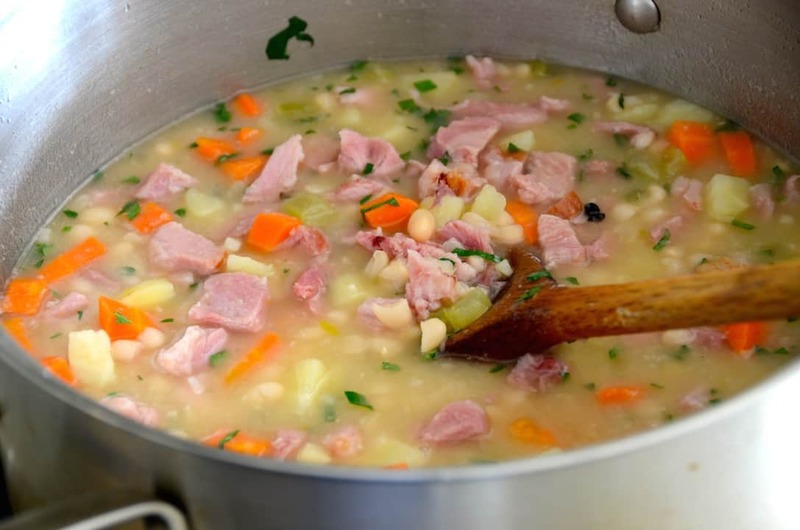 In 2018, NAVY BEAN SOUP WITH HAM is it! 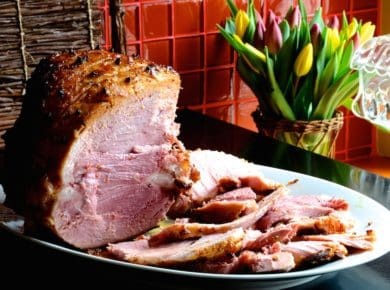 With this update, we offer you options; same great recipe but you get to decide whether to make it with SMOKED TURKEY or, a rich tasting, SMOKED HAM HOCK. Whichever your preference, we guarantee you won’t be disappointed. In fact, we expect this to become the one navy bean soup recipe you always turn to. We’re proud to say it’s THAT good! This treasured family recipe is straight from my mom’s old recipe box, thus two of my big sisters chimed in with tips for success. Maria says rinsing and draining the beans a few times reduces the chance of… flatulence! Good one! Dana suggests the salt be added only after the soup is fully cooked to keep those beans tender. Who knew? Here are a few additional things to consider when you go to prepare it. NAVY BEANS – I’m not sure why my mom always used navy beans for this recipe but I’m sure glad that she did. They plump up perfectly when you soak them overnight and I like how cooking them makes them tender but doesn’t turn them into mush. They’re also rich in dietary-fibre to help stabilize blood sugar levels making them an ideal legume for a bean soup recipe. 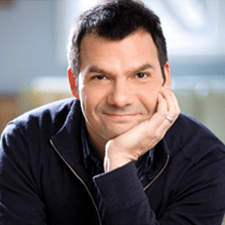 THE VEGGIE MIX – I like the simplicity of the vegetables used to help flavour this soup. Using onion, garlic and celery to begin the recipe is a favourite combination, while the carrots and parsnips both add a subtle sweetness to the broth. SMOKED TURKEY THIGH – Finding a smoked turkey thigh at your grocery store isn’t always easy so I suggest calling ahead to see if they have one available. Failing that, call a speciality butcher to see if they have smoked poultry handy. The smoked turkey may be less flavourful than the ham, but it also has less fat. Decisions, decisions. SMOKED HAM HOCK – I picked up my smoked ham hock at ST. LAWRENCE MARKET. Ideally, you’re looking for a hock that has less skin and more meat. 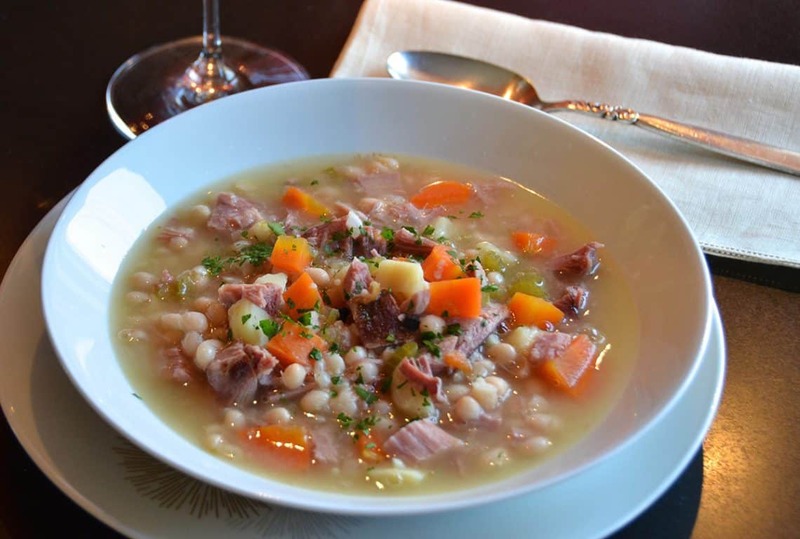 When purchasing the smoked ham hock for this recipe, tell your butcher what you intend to make. Once they stop drooling, I bet you’ll walk out with the best piece of meat in the house. Never forget, speciality purveyors want your recipes to succeed… as much as we do! 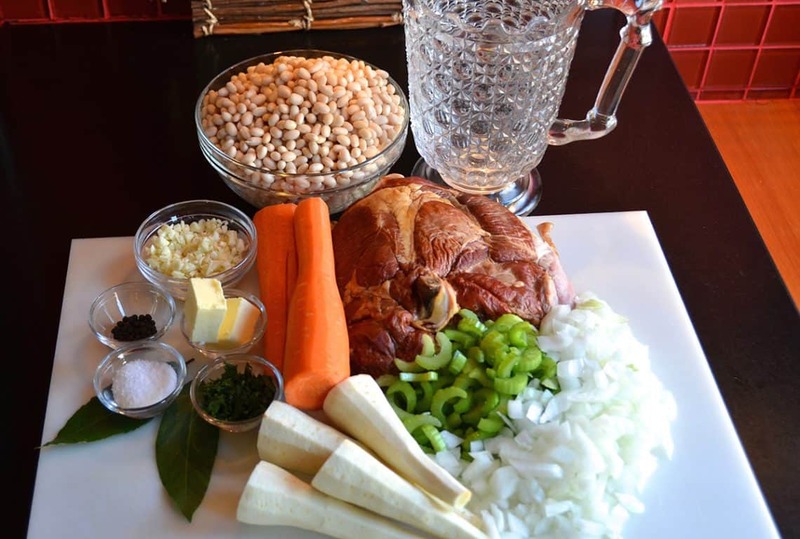 We know you’re going to love everything about this recipe, in fact, we think you’ll agree, it’s the best navy bean soup you’ve ever had. If you’d like to serve it with something equally as tasty, what about our BUTTERMILK CHEESE BISCUITS served warm with a blob of butter? Amazing! 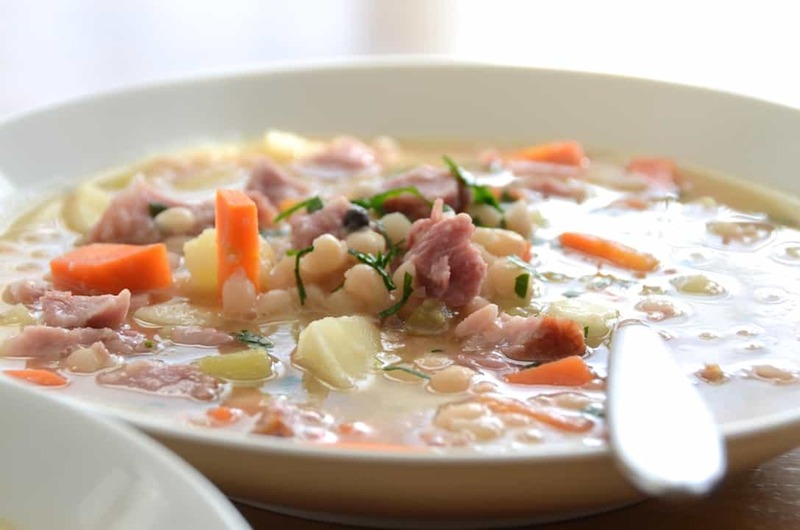 Enjoy this NAVY BEAN SOUP WITH HAM (or smoked turkey) remembering: there’s nothing more fabulous than the simple comforts of home. Listening to great music is an essential part of every Weekend at the Cottage. 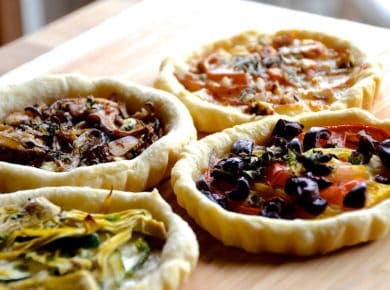 I put on some big music while making this recipe, Brahms: A German Requiem – Melbourne Symphony Orchestra, Teddy Tahu Rhodes, Johannes Fritzsch & Nicole Car. If you’re a lover of choral music please visit iTunes to learn more about this astounding masterpiece.